The Los Altos Model Forest initiative arose from a concern over the management of natural resources in the area and the need to make it sustainable and adequate, according to its capacity of permissible use, allowing the conservation and rational use of natural resources to ensure the social well-being of the population. The Model Forest platform is a great opportunity to bring together the key stakeholders responsible for the management of forests and natural resources in the eight municipalities that are currently part of it, therefore strengthening the organization of the communities regarding the conservation and sustainability of the forest management. The current Board of Directors of the Forestry Roundtable of Region VI (MESAFORC-VI) has assumed the leadership of the Model Forest initiative. MESAFORC-VI works to raise awareness among stakeholders regarding the sustainable management and the conservation of natural resources, which are the main source of income in this region, with a great potential to guarantee the food and the nutritional security of the inhabitants, as well as the conservation of biodiversity and ecotourism. The Los Altos Model Forest is located within the Department of Quetzaltenango, Guatemala. 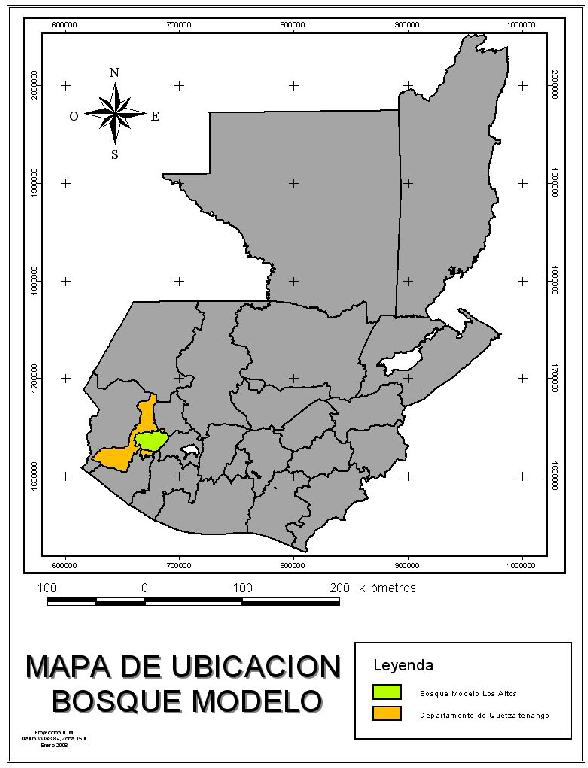 It covers the municipalities of Concepción Chiquirichapa, San Martín Sacatepequez, San Mateo, Quetzaltenango, Almolonga, Cantel, Zunil and El Palmar. Its mountainous terrain and broken topography characterize the landscape with heights ranging from 1,500 to 4,200 meters above sea level. It is within the basins of the Ocosito, Naranjo and Samalá rivers, which reflect a wide variety of climates, mostly within forestry-oriented areas, which are favorable to the protection of wildlife. It includes 12 protected areas, with national parks, permanently closed areas, and municipal regional parks, covering more than 24,000 ha. The economy of the area is based on forestry production, agriculture and wood processing, as well as production of textiles and handcrafts. The population of the area is composed of two main ethnic groups: the indigenous people that preserve their traditions and language and are located mainly in the highlands; and the non-indigenous, or ladinos, located in the Southern municipalities. There is a tendency to land overuse due to the increase of agricultural production, especially with annual crops in soils more fitted for forestry or grazing, which increases the risks of landslides and floods in the channels of the rivers. In the Los Altos Model Forest, the participating civil associations, governmental and non-governmental organizations are all committed to social sensitivity. They are convinced that the solution to forest and environmental problems in Guatemala rests on the contribution of all, from the workers of the national system in charge of natural resources to other entities that work in sectors related to it. And more importantly, the population must have the opportunity and capacity to be able to make decisions on how to complement the institutional actions. The National Institute of Forests (INAB), the National Council of Protected Areas (CONAP), the Ministry of Environment and Natural Resources (MARN), the Ministry of Agriculture and Food (MAGA), the Guatemalan Institute of Tourism (INGUAT), and the University of San Carlos de Guatemala (USAC). The Metropolis of Los Altos (Commonwealth of Metropolis of Los Altos), the municipalities of Concepción Chiquirichapa, San Mateo, Zunil, Cantel, San Martin Sacatepequez, Quetzaltenango, El Palmar and Almolonga, municipal forest technicians, the Community Development Councils (COCODES), the Municipal Development Councils (COMUDES), and the Departmental Development Council (CODEDE). The Federation of Agroecology and Agroforestry associations of Western Guatemala (FEDERAFOGUA), the Environmental Development Program (FUNDAP), CARE, HELVETAS, the International Union for the Conservation of Nature (IUCN), the Forest Association of Quetzaltenango (ASOFORQ), forest regents, Rural University (UR), and the Rafael Landivar University (URL). The representatives of the population of the municipalities of Concepción Chiquirichapa, San Mateo, Zunil, Cantel, San Martin Sacatepequez, Quetzaltenango, El Palmar and Almolonga. Harmonizing environmental, social, cultural, productive and economic issues through management and administration by deconcentrating and decentralizing resources, in training, financing, marketing and advisory processes for sustainable development initiatives. Strengthening the access to incentives and credits as key elements for sustainable development. The annual celebration of the Western Forestry Fair has been consolidated with its 18 editions of Expomueble, Expoforestal and events related to the promotion of forestry goods and services in Quetzaltenango.